Displaying 1 - 60 of 128 items found. Add pretty, textured color to your walls with this Southwest-inspired free quilting pattern. It's easy to stitch and comes together quickly. Quilt Size: 24" x 24"; templates included. Bring a touch of the tropics into your home with this foundation-pieced block. This intricately designed block can be used to decorate a pillow or can be repeated and used in a quilt. Floral prints combined with pastels create a soft, summery wall quilt. This free wall quilt pattern would look great in a nursery -- or even a craft room. Finished Quilt Size: 37" x 37". Block Size: 9" x 9". What's the easiest way to brighten up a room? Stitch a free wall quilt pattern like this one! Featuring brightly colored fabric, three-dimensional flowers and butterflies, this design will make any room sparkle. Quilt size: 18" x 24". Everyone needs a little love. Use this free quilting pattern to let the ones you love know that you care. This design is easy enough for a beginner to stitch, too! Finished Quilt Size: 18 1/2" x 12 1/2". Liven up simple Pine Tree blocks with Log Cabin strips and finish off with an interesting directional border. Finished Quilt Size: 8 3/4" x 17 1/4". Block Size: 4 1/4" x 4 1/4". This design is from an early Navajo rug. Quilt size: 32" x 32". Learn to sponge fabric using fabric paint and a kitchen sponge. Planting season is just around the corner every day with this fabric planting scene. Finished Quilt Size: 18" x 15". Make a Log Cabin wall quilt using an old pattern with contemporary dyed fabrics. Wall Quilt Size: 28" x 28". Trace and cut out the fused motifs wherever you are and finish the project when you get home. Quilt Size: 12" x 21". Have some summer fun stitching this summery beach blanket. 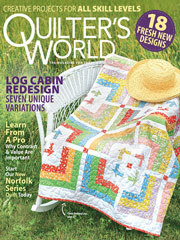 This e-pattern was originally published in the August 2005 issue of Quilter's World magazine. What little girl doesn't love butterflies? Stitch this free kids quilting pattern set in your child's favorite colors -- as a scrap quilt or in points as shown. Finished Quilt Size: 62" x 62". Block Size: 10" x 10". Reproducing a copy of an antique quilt exactly isn't what I had in mind when I made my own Checkerboard quilt. The original quilt is a one-of-a-kind and should not be copied exactly. Quilt Size: Approximately 46" x 46". The block unit used in this creative throw issimilar to a Courthouse Steps design in that the block begins in the center and rows are added around it. Precut 1 1/2" strips make piecing a joy! This e-pattern was originally published in Inspiration for Precuts. Size: 45" x 59". Block Size: 11" x 11". Scraps in a variety of rich colors and fabrics combine with an assortment of embroidery stitches to create an antique look in this wall quilt with matching pillow. This e-pattern was originally published in Quilting to Go. Size: Wall Quilt: 24" x 24". Pillow: 18" x 18". Block Size: 10" x 10", 14" x 14", both finished. Stretch the Starry Path and Eight-Pointed Star designs from squares to rectangles to create star blocks that seem to twist and turn across the quilt. This e-pattern was originally published in Twisted Classics. Size: 27" x 36". Block Size: 6" x 9". Faith, hope and joy are things that make life worth living. Remind yourself -- or a friend -- of that when you use this free quilting pattern to stitch a folksy wall quilt. Easy and quick to stitch, this quilt will look lovely in your home. Finished size: 36" x 40". Create this little topper or wall quilt using leftover triangles, or create new ones in a whole new color scheme. Quilt Size: 13 1/2" x 13 1/2". Fabric yo-yos make the grapes, and folded squares create the petals on this basket-design wall quilt. Quilt Size: 14" x 34". The 3-D effect of spinning pinwheels is created on this pieced throw by the clean contrast of rich hues against a white background. A colorful border of prairie points adds further interest. This e-pattern was originally published in Easy Four-Patch Quilting. Size: 46" x 58", excluding prairie points.